The craft beer industry has many great stories about families coming together in a commercial brewing enterprise – the Careys of New Glarus Brewing, the Klisch brothers of Lakefront Brewery in Milwaukee, the Lonsways of Stone Arch in Appleton, the Buttera family at O’so in Plover, to name just a few here in Wisconsin. Danny and John McMahon with assistant brewer Joe Radosevich at the Egg Harbor Ale Fest on Sept. 21. Add the McMahons of Door County Brewing Co. to that list. Danny was 7 when his family moved to Door County. “This is where I spent most of my life,” he said. But he left for college in Minneapolis and both he and his family thought he wouldn’t be coming back to Door County for anything other than family visits. Meanwhile, Danny’s college roommate bought a homebrew kit. “We just got hooked right away. We just kept going at it,” Danny said. “He’d bring beers home that he brewed, and it was just fantastic,” John said. If there were, he knew a young man who could serve as brewmaster. The original brewing concept idea involved the Wild Tomato in Fish Creek. “Britt (Unkefer, owner with wife Sara of Wild Tomato) and I talked about brewing in the back. Turns out they’re in a flood plain and can’t expand,” John said. “Then it evolved into finding that building in Baileys,” Danny said of the old grocery store at 2434 County Road F in Baileys Harbor. The company is conducting a capital campaign to raise money for the brewing equipment, but currently contract brews with Sand Creek on the other side of the state in Black River Falls, Wis.
“It’s a long haul,” Danny said, but both he and his father said they explored a number of contracting brewing options and felt most comfortable with the Sand Creek Brewery. They made a conscious decision to do something different with a first release, thus Polka King Porter was born. The proof of their success to date is in the numbers. By Memorial Day 2014, they hope to have the Baileys Harbor building open with a taproom and merchandise area upstairs and downstairs a sour ale production facility. 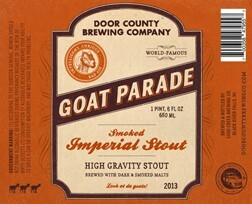 On Saturday, Oct. 5, the brewery will open its garage door for the release of its first special edition beer, Goat Parade Smoked Imperial Stout in 22-ounce bottles. The lineup for the special release begins at 8:30 am. Wristbands will be issued to the first 150 people to buy the bottles at $15 each, with a limit of a dozen bottles per wristband. 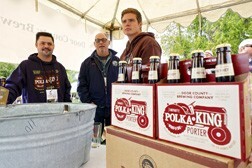 They also have a plan to involve local growers in the brewing of Door County Brewing Co. beers. “We’re very ambitious,” Danny added.